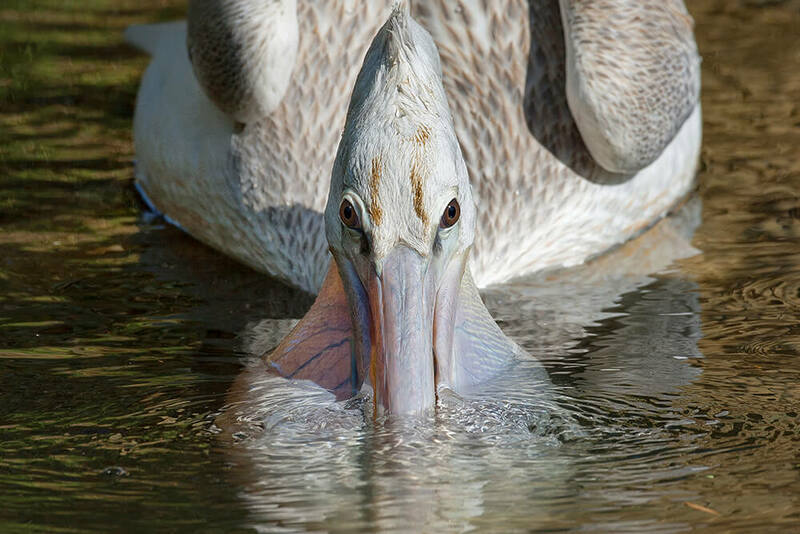 Kangaroos aren't the only ones with pouches: It is easy to identify pelicans, because they are one of the only birds with a pouch under their bill. There is a famous limerick that begins, “A wonderful bird is the pelican, his bill can hold more than his ‘belican’….” This enormous, naked skin pouch hangs from the lower half of the pelican's long, straight bill, hooked at the tip. The bird uses this pouch to catch fish and, as the limerick says, its bill does indeed hold more than its "belly can"! The unique pouch is also helpful in warm weather. While roosting in the hot sun, pelicans open their bill and flap the pouch to cool off. Along with the giant pouch, pelicans are a large bird with short legs, and they appear rather clumsy on land. Once in the water, they are strong swimmers, thanks to their webbed feet. Pelicans and their relatives—cormorants, gannets, and boobies—are the only birds with totipalmate feet. This means that webbing connects all four of their toes, even the back toe. Pelicans also get a little help staying afloat: air pockets in their skeleton and beneath their wings provide added buoyancy. And the birds use their bill to coat their feathers with a waterproof oil from a gland at the base of the tail. This keeps their feathers from becoming waterlogged and weighing them down. 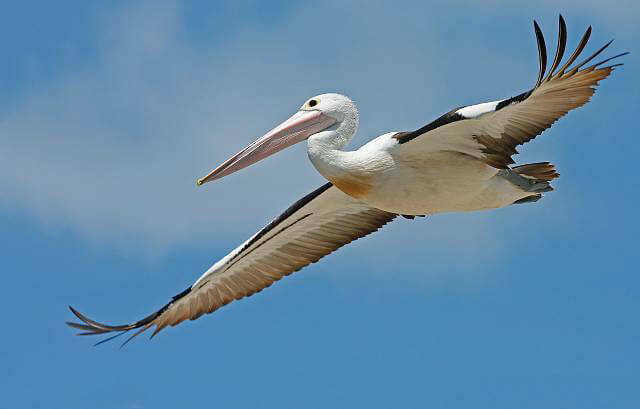 Pelicans are splendid fliers, too, and can soar like eagles with their giant wings. Getting UP in the air can be challenging without the help of the wind. Pelicans must run over the water while beating their big wings and pounding the surface of the water with both feet in unison to get enough speed for takeoff. Pelicans live throughout the world in tropic and temperate zones, and always near bodies of water. Brown pelicans are exclusively marine birds. All pelicans like to be around other pelicans, and they don't mind being around other bird species, either, be they cormorants or flamingos. They nest in colonies in trees, bushes, or on the ground, depending on the species. When not eating, pelicans spend hours preening, snoozing, or sunbathing. At dusk, pelicans all settle down for the night. Their head rests back on their shoulders, their eyes close and their feathers ruffled against the cold. One can often see pelicans flying in flocks, as they are social birds. They may fly in a V formation but usually fly in a single line. Pelicans live in flocks, too, with the young and adults of both sexes grouped together throughout much of the year. As water birds, pelicans use fish as their main food source. If a small reptile or amphibian comes their way, they might eat that, too! Pelicans use their bill pouch like a fishing net to scoop the fish into their bill. They then tip their head forward to drain out the water. They do not carry fish (often more than one per catch) far in their bill; rather, they throw back their head and swallow the food whole. Should the scoop-and-gulp method fail, pelicans have a back-up plan: a little hook at the end of the bill can snag fish. Brown pelican—a plunge diver that fishes over salt water. The brown pelican can sight a fish when flying at heights up to 70 feet (21 meters). The bird then dives headfirst into the water. It may submerge completely, with a great splash, or just a bit, depending on the height of the dive. Air sacs under its skin cushion the impact of hitting the water, and the sacs also help the bird bob back to the surface like a feathered cork. 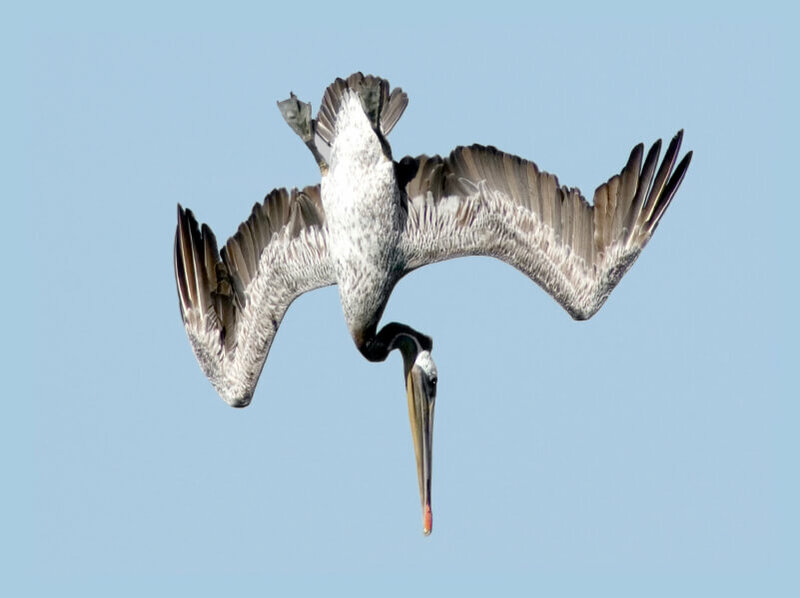 The brown pelican seems to be the only species that uses this method of fishing. American white, Australian, and great white pelican—group fishers. Four to five pelicans swim side by side, gliding in a semicircle facing the shore. Then, with much wing flapping and water splashing, they drive fish ahead of them toward the shore. Once the fish are in shallow water, it is easy for the pelicans to scoop them up in their bill! Pink-backed and spot-billed pelican—quick grabbers. These pelicans paddle along in the water, usually where there is a lot of vegetation where they can hide. They slowly swim up to prey near the surface and then catch it with a quick scoop of the bill. These birds like to hunt by themselves. Dalmatian pelican—let others find the fish! In the Prespa Lakes of Greece, the Dalmatian pelican may fly with cormorants. The cormorants dive deep in the water, which brings the fish to the surface for the pelican to scoop up! It’s a good thing pelicans are successful fishers, because they are among the largest of all birds. An adult pelican may eat up to 4 pounds (1.8 kilograms) of fish per day! Around the world, pelicans are accused of competing with fishermen as well as with the commercial fishing industry. Yet studies show that pelicans usually eat “rough” fish, such as carp, shiners, mullet, and minnows, which are not favorites with people. Pelicans at the San Diego Zoo and San Diego Zoo Safari Park get trout, smelt, mackerel, herring, sardines, or trout, depending on the species. Pelicans rarely make a sound outside of their breeding colony. If displeased, they hiss through the gaping bill. Only at mealtimes or in their large breeding colonies do the pelicans become vocal, indulging in a sort of grunting sound to express their excitement. Some pelicans also clap their bill while looking up, gape, bow, and wag their head to defend territory. Breeding colonies often consist of hundreds of these birds all crowded onto one small island. Breeding season varies with the species. 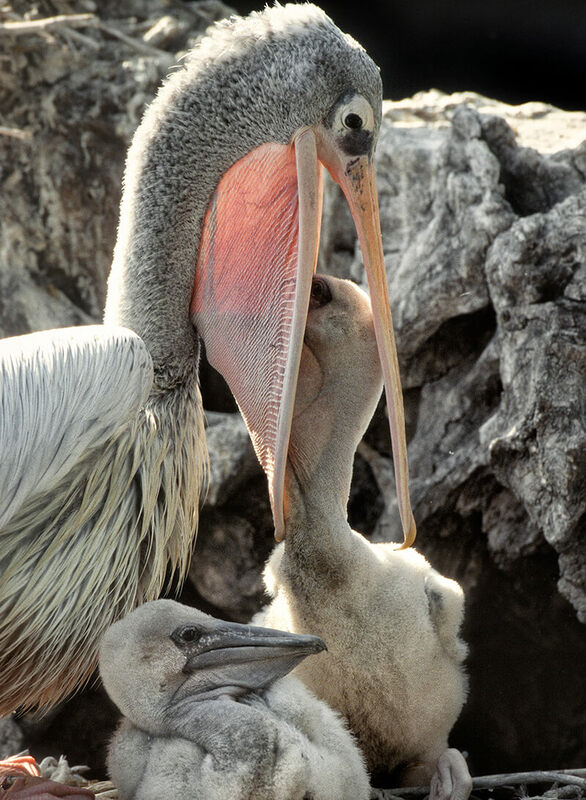 Brown pelicans in warmer climes may nest throughout the year. 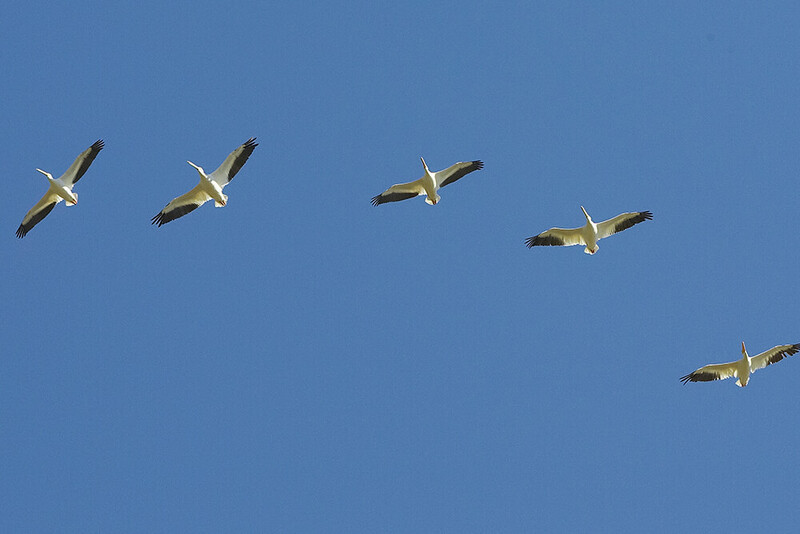 American white pelicans in colder areas nest in May and June. At the start of the breeding season, a pelican’s bare face and pouch flush yellow, pink, or orange, depending on species and gender, and an occipital (back of the head) crest forms. American white pelicans develop a knob on the top of the bill that is shed after the breeding season. The female’s facial skin turns pastel orange, and males get a pale yellow coloring on their face. During breeding season, both male and female pelicans use their pouch to carry nest-building materials: twigs, grass, and feathers. The nest is often a hollow in the sand with a ring of sticks and sand scraped around the outside. If located where materials are available, the nests may include weed stalks or may even be built in low bushes or mangrove trees. The parents take turns incubating one to six bluish-white eggs, laid days apart, on the top of their feet. The eggs hatch in the order laid, and the first chick to hatch is always larger and often attacks its younger siblings to get the most food. Chicks hatch with eyes shut and have a stubby bill and bare, pink skin. Within a few days, their eyes open, they start to grow their first down feathers, and their bill lengthens. The young are not fed from the pouch; instead, the parents open their mouth wide to allow the young to reach down into the gullet to get regurgitated food. The poor parents must feed their chicks up to 30 times a day for the first month of so! It takes a while for a young pelican to learn to use its enormous bill without getting it snagged on sharp rocks. The chick gets its wing and tail feathers after three to four weeks. At this point, the young of ground-nesting pelicans cluster together in pods while both parents hunt. When they return, the parents are able to find their own chicks in the pod and feed them. Chicks fledge in 70 to 85 days and join their parents for fishing and roosting. Yet it’s a dangerous world for the youngsters, and most do not survive their first year, due largely to predation by birds of prey. The San Diego Zoo and San Diego Zoo Safari Park’s pelicans have bird lovers flocking to see them. At the Zoo, four young great white pelicans, two males and two females, live in an exhibit on Park Way, just down the slope from the birds of prey aviaries. They share their home with cormorants, ducks, and other water birds. At the Safari Park, pelicans have been one of its big success stories. The Park has assembled the most comprehensive and productive collection of pelicans in North America and is the only accredited facility with great white, Dalmatian, and pink-backed pelicans. The Park’s Africa Tram tour offers the chance to see all three pelican species. In the South Africa field exhibit, Dalmatian and great white pelicans live together. The Dalmatians are fond of nesting on the island in the exhibit, which is only accessible to keepers by boat. In the Central Africa field exhibit, a dozen pelican youngsters, from all three species, spend their weaning period with two older birds that serve as mentors. The Park’s African Forest houses pink-backed pelicans and also features a small island for the birds to enjoy. The use of the insecticide DDT almost wiped out pelicans and other birds by causing eggshells to thin. Pelicans received large doses of the chemical from the fish they ate, due to pesticide contamination in the water from runoff and the direct dumping of DDT waste, which affected the ocean’s food chain. In addition, nesting colonies were disturbed as more people moved to coastal areas. By 1970, brown pelicans were listed as endangered. The ban on DDT use in 1972 proved beneficial for pelicans, and their numbers gradually returned. But another problem confronts the brown pelican. They have discovered that food is easily attained from fishermen in boats and on bridges or piers. What they haven’t discovered, however, is a way to avoid the fisherman’s dangerous hooks and lines. Birds have received serious injuries to almost every part of their body from barbed hooks. When fishermen snag a pelican, they often cut their lines rather than bringing the bird in and carefully removing the hook. And the 2010 oil spill in the Gulf of Mexico has caused the slow decay of mangrove swamps where thousands of the birds used to nest. 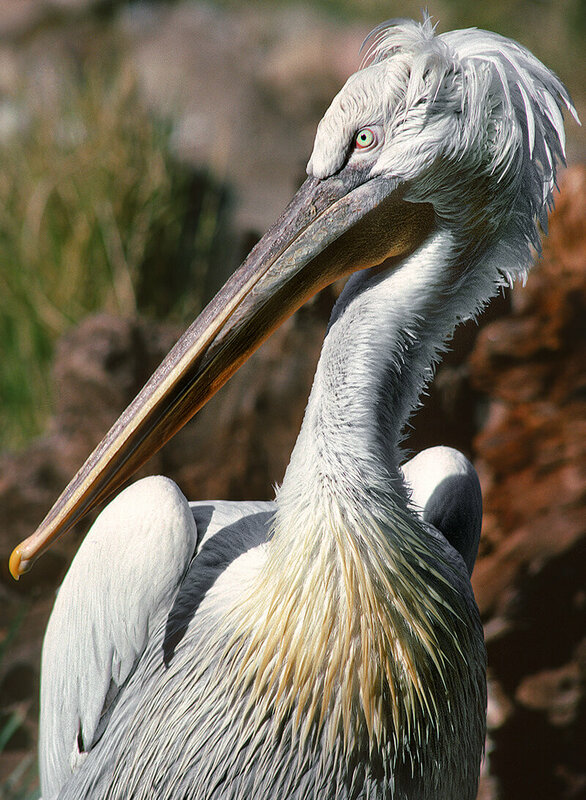 Likewise, things are looking grim for the Dalmatian pelican, which is native to eastern Europe and parts of Asia. As a ground nester, shrinking wetlands caused its population to drop. But recent conservation efforts, including legal protection, have greatly helped this pelican species. Although it is still a vulnerable species, there is some hope! Even though pelicans may be unusual looking, they have successfully adapted to their various habitats for millions of years. So far there are no endangered pelican species, and we hope that with continuing conservation education, this is how their status will remain. Pelicans are an old family of birds, with fossils dating back almost 40 million years. The lower half of a pelican's bill can hold up to 3 gallons (11 liters) of water, which is 2 to 3 times more than can be held in its stomach. Contrary to popular belief, pelicans do not store the catch of the day in their pouch for later consumption.